When some claim austerity is the only answer to today’s economic woes, a close look at the best practices in Scandinavia and Finland gives pause for thought. Cited as models for their egalitarian social and health policies, these countries also have thriving economies where the gap dividing rich from poor is smaller than elsewhere. Despite their quasi mythic status, the policies implemented to combat inequalities in health are neither well known nor understood. 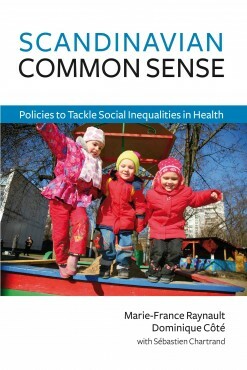 Policies discussed in Scandinavian Common Sense include education, housing, conciliation of work and family life, daycare, sustainable development and more. For these policies to be part of political debate, be it in Quebec, Canada, the United States or elsewhere, they must be in the public domain. That is the purpose of this book. Marie-France Raynault (MD, MSc Epidemiology, FRCP(c), FCAHS) is a medical doctor specialized in public health. She heads the Département de médecine préventive et santé publique at the Centre hospitalier de l’Université de Montréal. She also heads the Lea Roback Research Centre, which she co-founded. Throughout her career, her main interest has been the health of the poor. Dominique Côté (MA Sociology) is a researcher in health and social services. Her Master’s thesis on the family and work-life balancing policies of the Nordic countries. She is a research officer at the Lea Roback Research Centre. Sébastien Chartrand (PhD Sociology) studied community organizations in Sweden at Stockholm University. He also worked as a research officer for the Lea Roback Research Center. Now he teaches in Germany. The mission the Léa-Roback Research Centre in Montreal is to contribute to reducing social inequalities in health and improving living conditions.